Vicious racing dogs have no relation to rock as far as I know, but do make a hell of an album cover. I've sometimes had the very un-American sounding, non-troop/bald eagle supporting view that while our country invented rock music, the British have perfected it and are historically just better at it than we are. You could even take away the Beatles and the Rolling Stones and I'd still just ask you to look at the 1970's alone. Led Zeppelin, Pink Floyd, Joy Division, The Who, David Bowie, Queen, Elton John, The Clash, etc. So much of what we consider to be the foundation for what we listen to today has been forged by those damned awesome Brits--probably in the same way that Chuck Berry, Buddy Holly, Little Richard, Jerry Lee Lewis, Bo Diddley, Muddy Waters, and Elvis Presley did for many of them. Americans laid the foundation. The British built the gigantic skyscraper on top of it. Now of course this isn't to say there isn't great American music. The British just appear to have a body of work that's hard--if not impossible to match--when it comes to rock 'n' roll. We still have them on soul and R&B and pop music in general, but I digress. 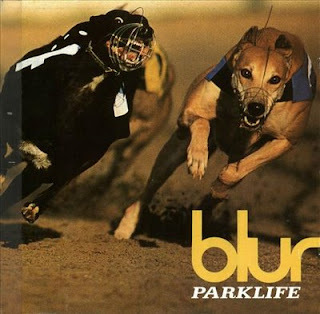 While Nirvana's Nevermind forged a huge shift in my little music brain in the early 90's and Radiohead's first couple of albums were really great (and much more appreciated by me now than they were then), it was Blur's Parklife that started my love affair with British music. Parklife is a stylish, complex, and always entertaining mix of rock and disco and synth pop and probably more influences than I can even describe fifteen years on. But the one pervasive element of this album that made it so different for me was that it was BRITISH, through and through. It has been written ad nauseam about how Blur frontman Damon Albarn wrote the songs contained herein with the specific intention of focusing on the British way of life. But for a young teenage American whose entire exposure to British music up to that point had been to bands that I either didn't know where British or didn't think sounded any different than an American artist, Parklife was a jolt to my system. Blur sound British. They talk about their life in their country without the slightest hint that their stories could be more interesting if told in an American setting (a la many Rolling Stones tunes). In fact, they openly mocked the "American stepchild" complex that many Brits at that time had in the hilarious "Magic America". The songs on the album range from classically dance-driven ("Boys and Girls") to absurdly funny ("Parklife") to heartbreakingly beautiful ("Badhead" and "This is a Low"). Parklife is a collection of genres, ideas, and emotions collected in a manner that reflected an entirely new point of view at the time for many of my age who had never really conceived of life standing on another country's soil. And while I assign importance and nostalgia to this album for a variety of reasons, what truly makes Parklife great is how enjoyable and catchy it is on top of all that. Take a flier and get in touch with your inner pop rock BBC. I think Albarn would be the first to disagree. This is not a rock album. It is a pop record, more in line with Bacharach than Berry.